Oooh, look what I caught. This little rascal got released in the park to keep him away from my nice ripe veggies. The weeks are just zipping by and summer is nearly over. The coast of southern California has remained cool all summer, with minimal need for a fan. One result has been sweet potatoes that aren’t making sweet potatoes and squash that up and die without making squash. But the tomatoes and green beans keep tootling along. A modest day's harvest of tomatoes, plus an onion and some komatsuna. I can see the tomato harvest diminishing but no where near disappearing. And with three more plantings of green beans in various stages, I hope for many more green beans. 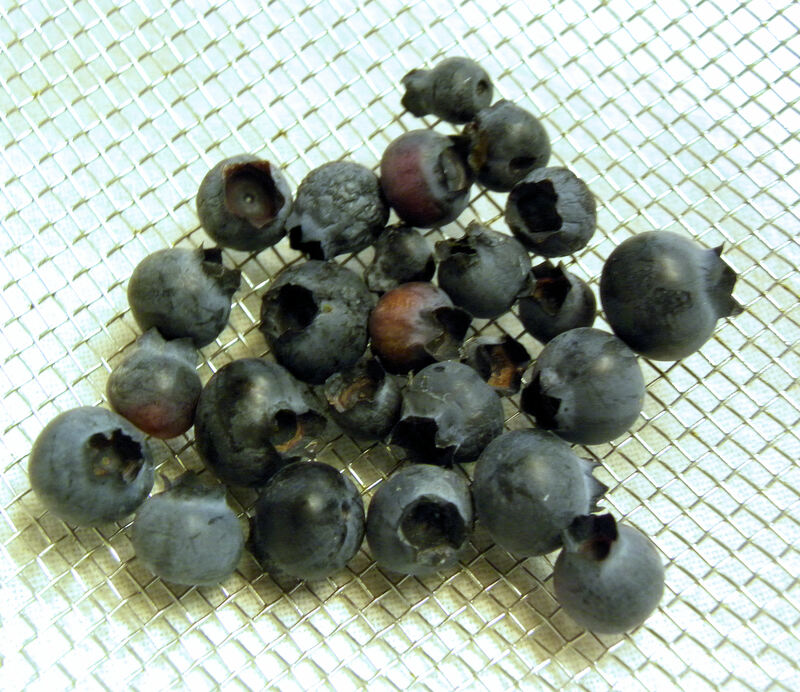 I harvested the last of the blueberries for this year. 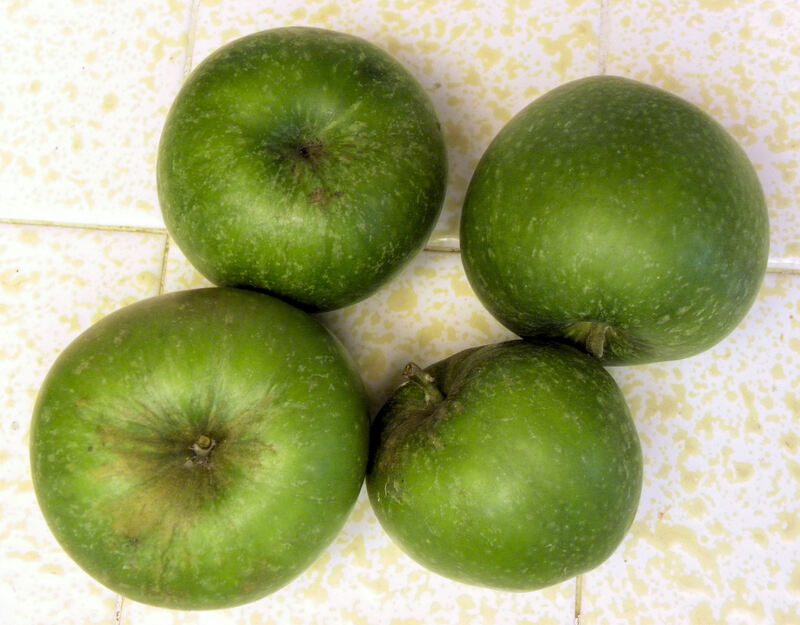 And the first of the Granny Smith apples. 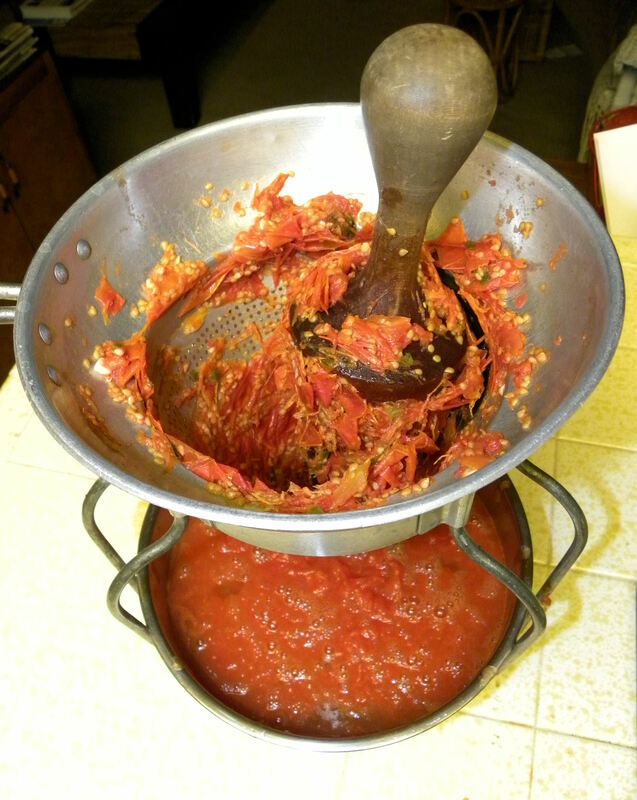 I used the glut of tomatoes to make spaghetti sauce. 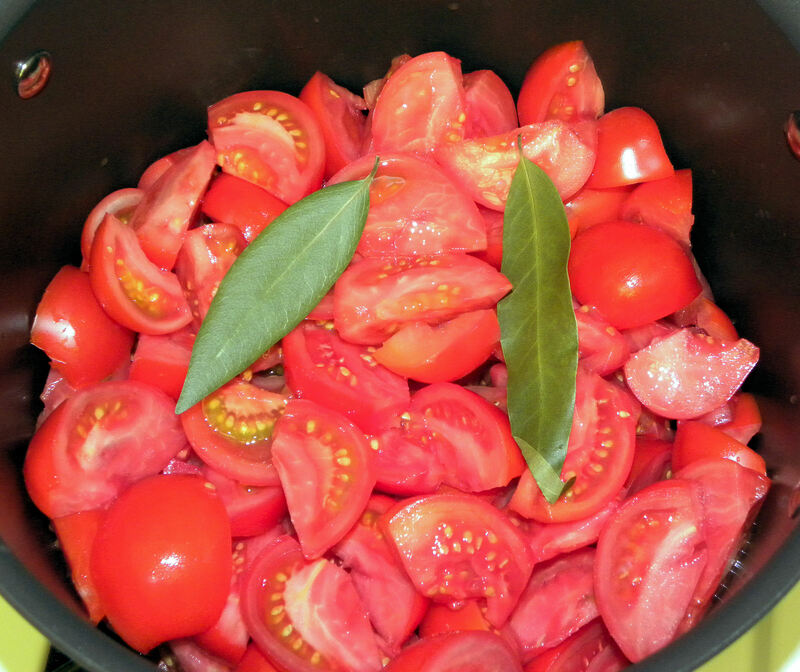 Cook sliced tomatoes with a couple of bay leaves and some onions, garlic and oregano. I simmer until the tomatoes are tender and cooked down a bit. I use my mother's old colander from the 1930s to strain the sauce. 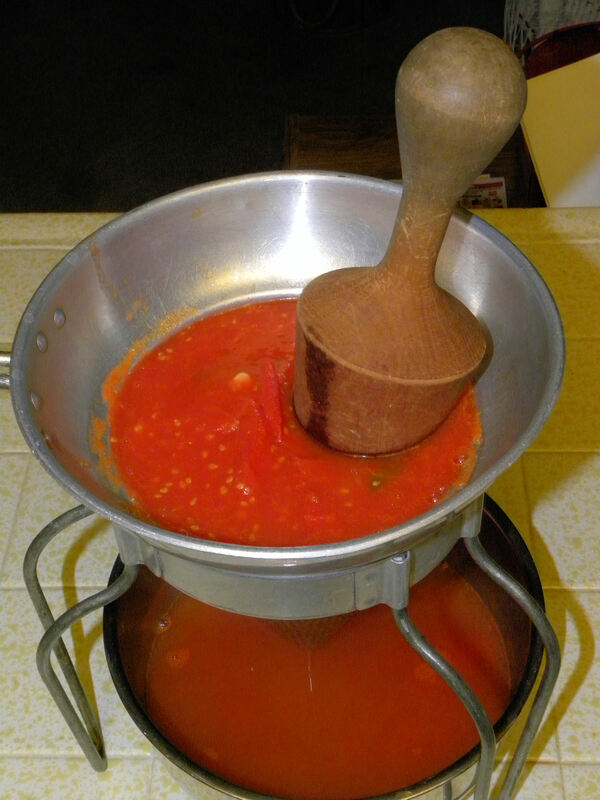 I use the pestle to force the tomato pulp through the colander. The seeds and skins are left in the colander. 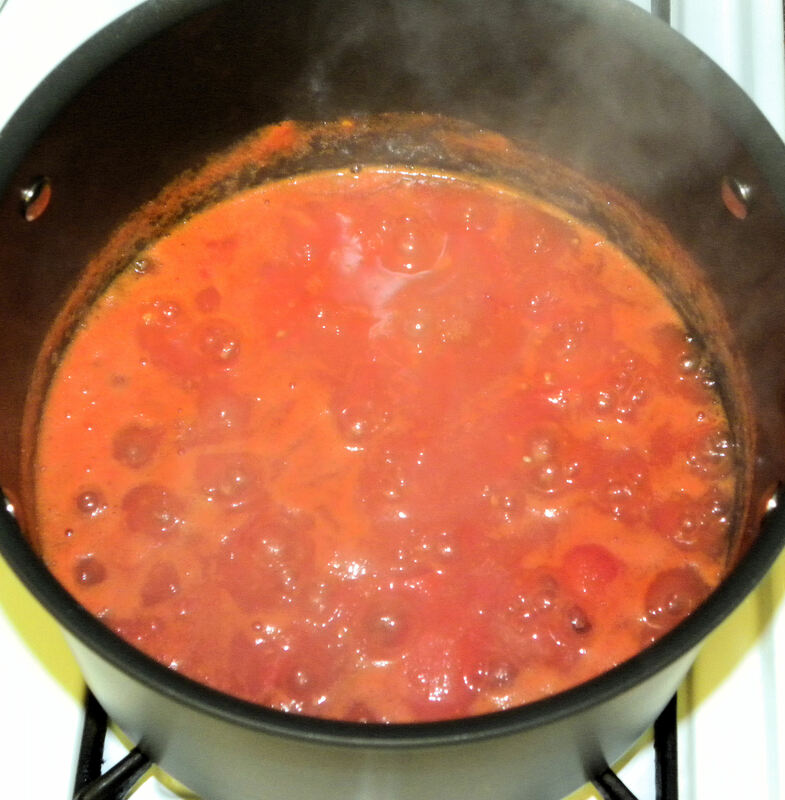 I add a can of tomato paste to the sauce and continue cooking until the consistency is just right. Then I freeze the sauce. I made salsa from the Black Krim tomatoes and used it for huevos rancheros and nachos. YUM! I scooped out seeds from my heirloom tomatoes to save. I put them in little glasses and let them ferment for three days. Oh, yuck. This is the result. But the experts say this is the way to do it. I rinsed the seeds in a tea strainer, swishing them around to remove the pulp and mold. Then I dried them on paper plates. We'll see next spring if they're viable. I saved seeds from Roma, Black Krim, Yellow Pear and a volunteer from the compost pile that made really good tomatoes. We'll see next year if it breeds true. Subtotal fruit 1 lb 3.5 oz. If you had a harvest this week, visit Daphne’s Dandelions and post a link to your blog. This entry was posted in Uncategorized and tagged blueberries, Fruit, Granny Smith apples, green beans, Harvest Monday, Komatsuna, photos, strawberries, vegetables. Bookmark the permalink. 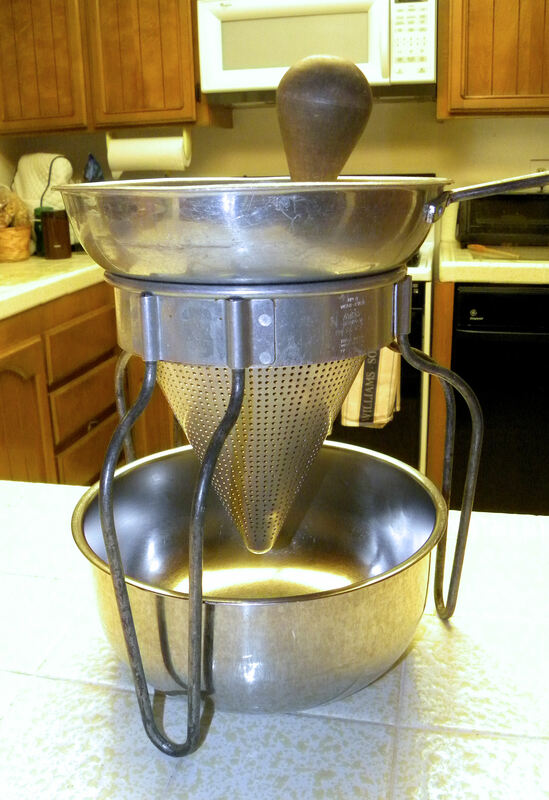 I’ve been thinking about getting one of those strainers – they have ones with a crank that pushes the pulp through the holes. I bet it would save time. Glad you have lots of tomatoes! Hi Stevie. You can also blend the sauce to chop up the skin and seeds, but I think you get a better tasting sauce if you strain them out. I just love my colander/strainer. Thanks for all those step by step pictures! 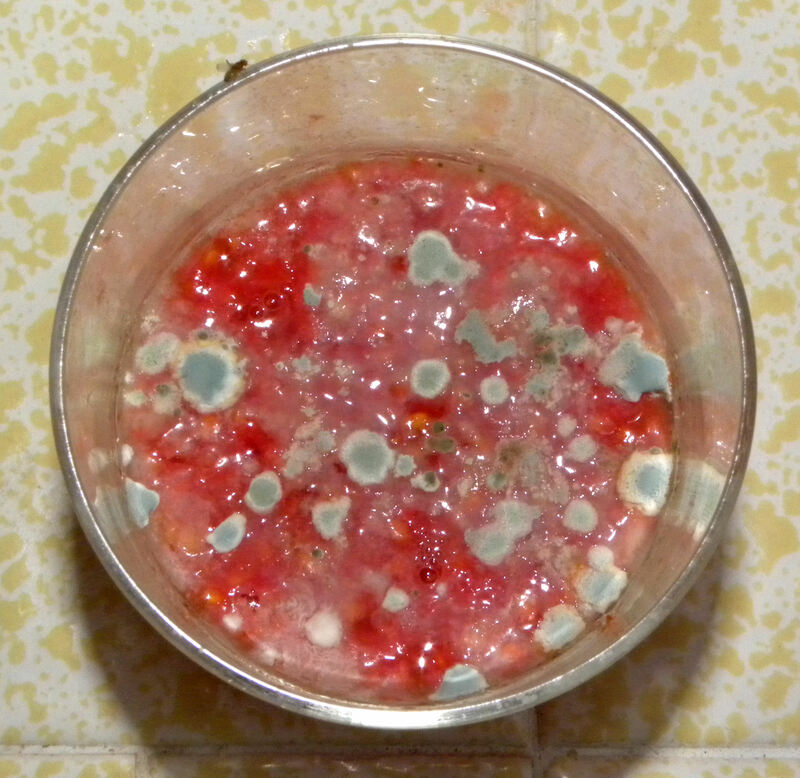 I’ve read about saving tomato seeds and needing to ferment the gel off, but I did not realize that everything was supposed to get moldy like that. Eek. I hope you get viable seeds from those tomatoes! 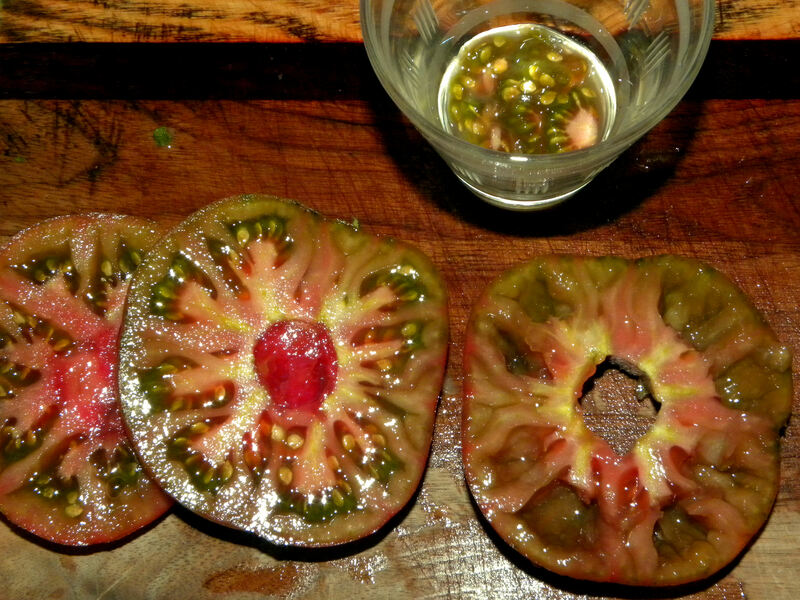 Your black krim tomato salsa sounds and looks delicious. Hi Thyme. I’m not so sure that the fermenting is necessary after talking to my sister-in-law, whose family has saved tomato seeds for generations. I’m now trying tomato seed saving without the fermentation. I have a strainer just like that! It must have been my grandmother’s, but my mom used it and I got it when she died. She made applesauce with it (among other things), leaving the skins on, and the sauce was pink and delicious. Good job with the critter. 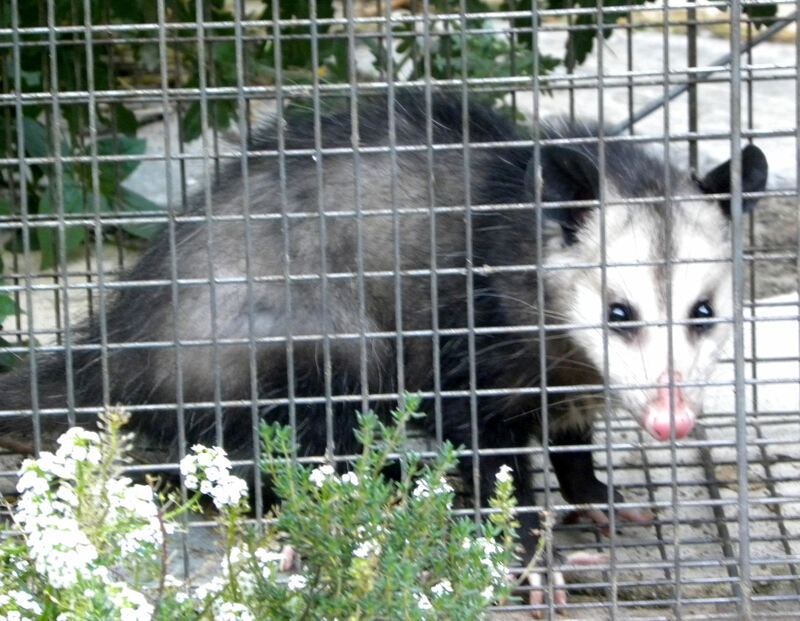 We caught one a while ago and moved him to a better zipcode. Hi Ali. My mom only used the colander for applesauce as far as I know. I’m sure my mom never made a single batch of spaghetti sauce her whole life. That was “foreign food” to her. Funny. That’s even older (and heavier) than my old strainer! You’ve made me very hungry for nachos. I have little cups, all across my kitchen windowsill, with fermenting tomato seeds. So far mine aren’t showing any mold. Hi Granny. 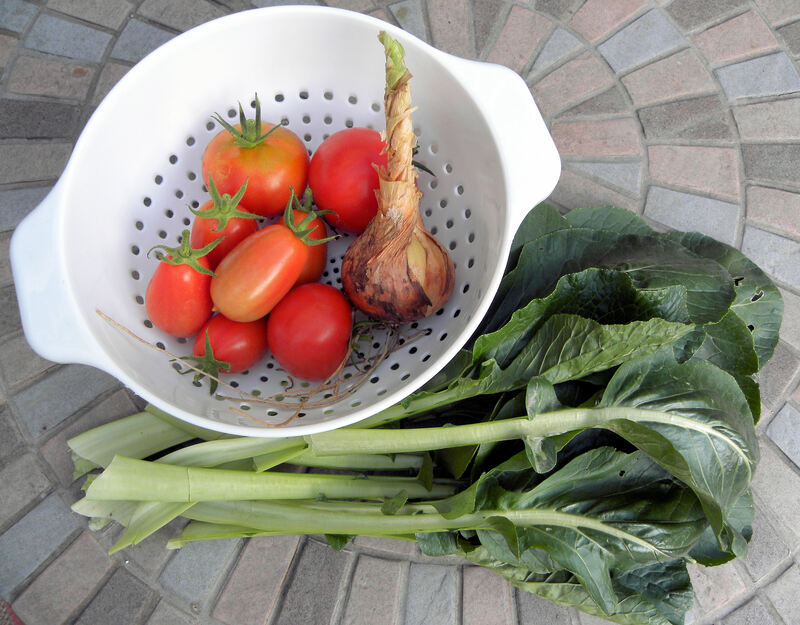 I do love that strainer/colander. You have a good harvest especially that little rascal. I like your colander, I’ve seen a similar model (flimsy looking) costs just a tad under 2oo bucks. Wow, Mac, $200 for a tomato colander? I’m glad that my family saves things and passes them down. That colander probably the one thing that I adored most in my mother’s kitchen. She also had a meat grinder, old cast aluminum coffee percolater, cast aluminum turkey roaster (that today’s turkeys are too big for), flour sifter and a number of other kitchen items that I’ve kept. I’ve never heard of needing fermentation to get viable tomato seeds. I’ve had really good luck with just spreading the seeds on a piece of aluminum foil. After a day or two the gel dries up, cementing the seeds to the foil in the process. In the spring I remove the seeds to plant and they’ve done just fine. Wish I had a colander like yours. Hi Barbara. I just heard from a friend who is the 7th generation in her family to save a particular strain of tomato seeds that they just spread them out on a paper towel and plant the paper towel along with the seeds in the spring. I’m trying that method for my Mortgage Lifters. 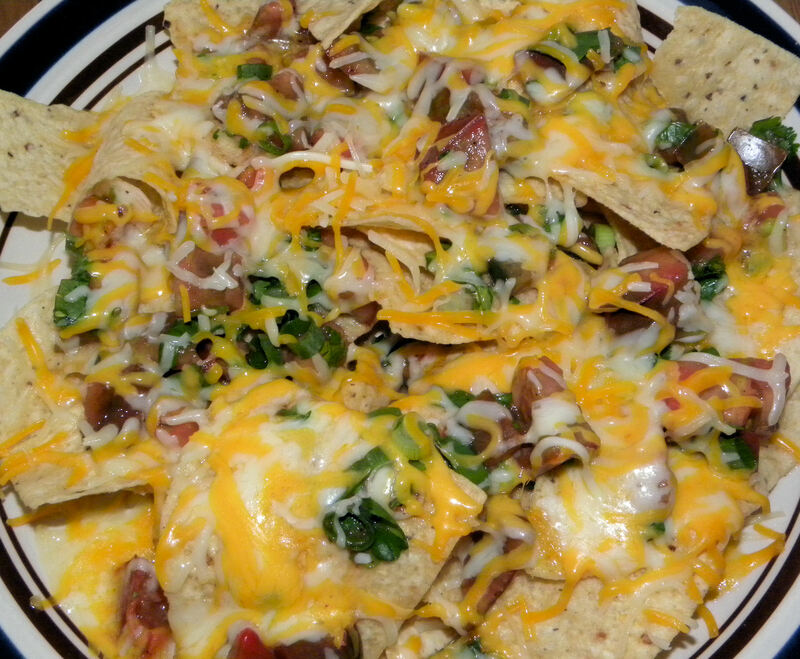 It is almost lunch time here, so those nachos aren’t helping one bit. Now I’m really hungry. I suppose I should just look a the batch of fermenting tomato seeds. That will keep the appetite down. I ferment my tomato seeds too. I haven’t saved as many varieties as last year though. Ewww, Daphne, mold and nachos really don’t go together, so they? We’re saving tomato seeds at the moment too, from our largest, best looking toms. The ‘fuzz’ phase is a bit icky, but it does work. Our Russian Persimmon tomatoes this year were from saved seed from three years ago, and they all germinated fantastically well! I’ll be curious to see how your volunteer turns out next year. Hi Clare. I’m going to plant several of the seeds from my volunteer tomato plant, which produced large, meaty, deep red tomatoes with green shoulders. They tasted better than my Mortgage Lifters, so I’m really hoping that they breed true, or that I can select a strain that continues those traits. I’ve named the variety Big Lou.